This is to notify the entire public that Mark Zuckerberg in conjunction with with Muhammadu Buhari the modern day African Adolf Hitler, has succeeded in taking down our facebook group account (Radio Biafra London). 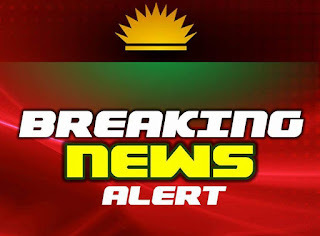 They also took down facebook accounts belonging to IPOB principal officers earlier today in the person of Uche Alphonsus Mefor, Clifford Iroanya, Uchenna Asiegbu, Austin Ofomah et al. Radio Biafra London (RBL) is the largest and fastest growing facebook community and close to having 1million members, but apparently the dictator in chief of the Islamic republic of Nigeria doesn’t want us to keep expanding, as he considers the facebook account another major threat. It is now clear to us what Zuckerberg's mission to Nigeria was as at the time he visited Buhari in Aso Rock. Mark Zuckerberg have been bribed into covering up the ongoing genocide against IPOB at the command of Buhari, having seen how formidable and unstoppable IPOB are. This signifies also that IPOB is and still remain Buhari's worse nightmare. Buhari has ignited another media war/blockade on us, but we are Biafrans and we never say die! We are advised to move to Radio Biafra facebook page where our news would be published like we usually do on RBL, we are also to move over to twitter and wage war against Zuckerberg Now! Note: IN CASE YOU DON'T FIND RADIO BIAFRA FACEBOOK PAGE, KNOW THAT IT HAS BEEN SHUT DOWN AS WELL..
Never knew that Zuckerberg could condescend to that level!!! So, why are you still here after your fraudulent game has been called off? Hope this is the final goodbye to everything Biafra... nurse your pains and try not to cry! I believe God wants us to build up so that he will show the world that he can speak even through the sand and stones. In God we trust and Biafra must stand. DEAR EKENE AND ALL BIAFRANS,PLEASE,DO NOT BE ALARMED,PERTURBED,DOWN OVER MARK AND HIS ACTIONS. MARK Z IS A GREEK AND WE ARE BIAFRANS.MARK Z'S SECRET KNOWLEDGE FROM CERTAIN GIFT/WISDOM FROM FATHER ABRAHAM THAT RABBENU MOSES,AKIBA,THE ELDER SIMON,GOAN,ABULAFIA,TZAYACH,CARO,SHLOMO,MAIMONIDES,RAMBAN,RAMBAM,ARI,ETC USED IS SAME KNOWLDGE THIS DESCENDANT FROM GREEK USED TO FIND HIS SECRET FACEBOOK. PLEASE,MAY ALL BIAFRANS KNOW IT TODAY THAT UMUIGBO-BIAFRANS HAVE SAME WISDOM FROM 11-1-2-2-1-12-1-8. YES,MARK Z,DO NOT BOTHER YOURSELF AND KINDLY DO WHAT YOU CONSIDER GOOD FOR YOUR FACEBOOK BUT BE REST ASSURED THAT BIAFRANS SHALL APPLY BOTH THE ANCIENT AND LATER WISDOM USED BY ALL HOUSE OF ISRAEL OF WHICH YOU HAVE ABUSED TODAY BY WORKING AGAINST HASHEM PROJECT. BIAFRAN REPUBLIC IS UNSTOPPABLE BECAUSE ITS ROOT IS INFINITE/ATZILUT AND BOTH MARK ZOCKERBURG AND HIS FACEBOOK IS FROM THE CREATION(YETZIRAH). OUR(BIAFRAN)SOUL IS AT THE FIFTH LEVEL WHILE FACEBOOK FOUNDER IS AT THE THIRD SO STOPPING BIAFRA IS THE GREATEST MISTAKE WHICH CAN ONLY BE ATTEMPTED BY A MARANO LIKE MARK Z. SO,BIAFRANS SHALL RENDER FACEBOOK AND ALL SECRETS USED BY MARK TO FIGHT HASHEM AS BIAFRANS ARE THE COMING GAD'S KINGDOM FROM THE RISING HOUSE OF JACOB.OUR DISCOVERIES SHALL OVERWHELME BOTH MARK AND THE WORLD IN BIAFRALAND. IT IS A PROMISE. BIAFRA LIVES!!! 4ROM THE BIAFRAN RABBI. Biafrans worldwide should simply cancel their Facebook accounts and stop making money for Zuckerberg. Even more important, Biafrans in Technology can build their own version book of Facebook. Facebook has only 1.2 billion users and the world population is over 7 billion. So, there's enormous market for other social media platforms. Zuckerberg is messing himself and his company up. You people should shut up. Maybe you have nothing sensible to do with your lives. This is not maybe, they don't have any sensible things to do with their lives. Fighting a lost battle always.